Thanksgiving weekend is here! Are you hosting dinner this year? Here are a few tips to make your hectic day of cooking and decorating just a little bit easier and less stressful. Hold a potluck: We know it’s last minute, but don’t be afraid to ask your guests and family to bring a dish. 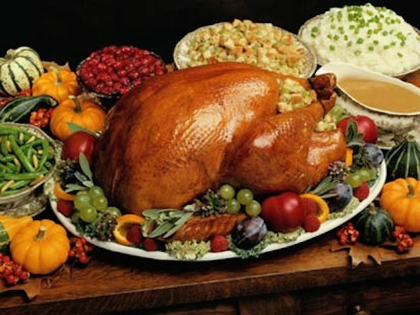 An extra salad, pie, or plate of mashed potatoes saves you time, allowing you to focus on cooking the perfect turkey! Make dishes in advance: Some plates can be prepared a day or two before the big night and then just heated up. Any kind of spreads or dips can easily be made ahead of time and refrigerated. You can even make something like a gratin, and then just bake it the day of, which should only take a few minutes. Set the table the night before: Setting the table can be a daunting task, especially when cooking for a large amount of people. If you’re ambitious, you’re doing more than setting a plate with a fork and knife. Charger plates, wine glasses, an assortment of cutlery, and decorations aren’t uncommon for Thanksgiving. You will save plenty of time if you simply set the table the day before everyone arrives. Ask for help: You only have two hands. You can’t be prepping a turkey, making a salad, serving drinks, mashing potatoes, baking a pie, and enjoying the company of your guests all at the same time. This weekend doesn’t have to be stressful – ask for help, you’ll be thankful you did. Decor tip: The staple Thanksgiving decor fixture is the centrepiece. The traditional centrepiece is a cornucopia, but we think you’ll find that putting together one of these from scratch is no easy task. You can always purchase one or make it out of fake materials, but it just won’t look authentic. We suggest resorting to the good old reliable mason jar – it’s like a modern cornucopia. All you have to do is stop in at a Value Village Thrift Store, buy some cheap, large mason jars or large glass containers, and then fill them with pinecones and apples and pears of varying colour. 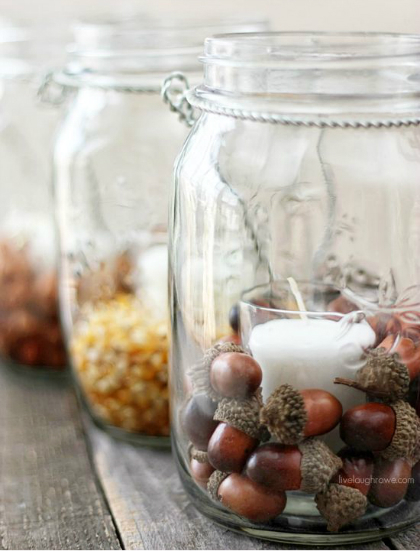 You can also line the bottom of the jars with acorns or kernels and place candles inside! Have a happy, stress free Thanksgiving everyone and have a safe long weekend!